Pain Management: Areas of the brain that suppress pain messages are activated when you eat chili peppers. 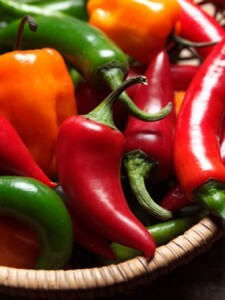 This particular mechanism of pain reduction is unique to capsaicin, according to research. Consuming capsaicin suppresses not only the pain messages from the capsaicin itself, but pain from other areas of your body, such as a recent sprain or muscle strain or chronic pain associated with arthritis. Weight Loss: Capsaicin promotes weight loss by boosting your metabolic rate. Its ability to prevent rebound weight gain may make it more effective than calorie restriction, in some cases. Cancer: Capsaicin decreases energy production in cancer cells and inhibits cancer-promoting enzymes. It also promotes programmed cell death in cancer cells — a process known as apoptosis. Brain Health: Nerve degeneration and seizure activity decrease with use of capsaicin. The chili pepper constituent also acts as an antioxidant in the brain by preventing oxidation of lipids, which comprise a large percentage of brain tissue.